Driving my black Jeep “quat-quat“.. I dabbed a bit of my mysterious.. enigmatic perfume. Upon arriving at the Raphael.. I was escorted to the hotel by two welcoming doormen and ushered down the long corridor.. which was filled with antiques and magnificent Artworks. 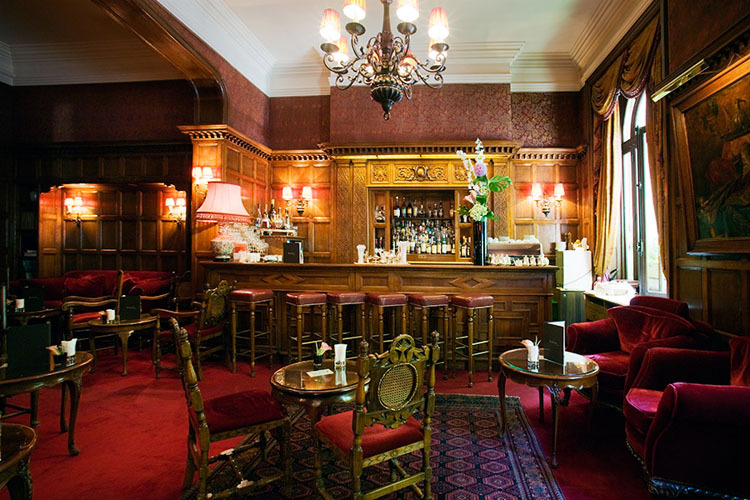 The elegant, diamond-shaped black and white marble flooring.. with luxurious carpeting.. gave that plush.. hushed.. feeling upon entering the “Bar Anglais“. With plush deep red fauteuils.. low round tables.. dark carpeting.. a dazzling bar.. shimmering like a jewel.. with its mirrors and crystal decanters..
Enticing.. intoxicating liqueurs, exotic spirits, wines, champagnes.. of all hues and colours.. with a charming chandelier to off-set the velvety red décor..